The Fisher Energy team's VS-1 Turbine Pumps are heavy duty single casing pumps designed to meet or exceed international standards developed by API-610, ANSI, Hydraulic Institute, and NFPA-20; and are available UL listed & FM approved for fire protection. 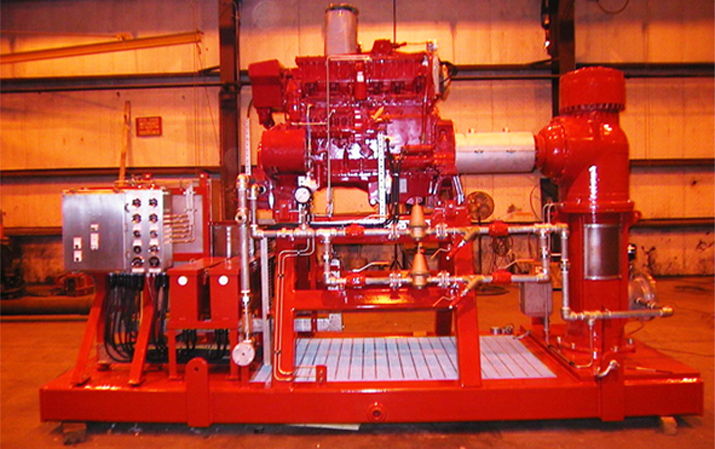 We design and deliver unitized systems that include the pump, driver, controls, piping and instrumentation. We design and develop our pumps with your needs in mind including local site environment, maintenance and quality. For example, the FisherPump Single Stuffing box and Spacer Coupling designs allows for quick seal replacement. Our pump columns are flanged and O-ringed for precision alignment and positive sealing while all machining is performed after welding for guaranteed alignment. Our shaft couplings are available in various threaded or keyed designs. The Fisher Energy team is experienced and knowledgeable regarding a wide range of materials and can work with any specified alloy or coating system. Our highly trained engineers can help you configure, install, and maintain systems that require Vertical Multi-Stage Turbine Pumps. We also provide replacement parts, maintenance, and repair services for both FisherPump and other brands of installed pumps. The FisherPump Vertical Turbine Multi Stage Barrel Pump is a heavy duty double casing pump enclosed in a suction barrel. They are engineered to meet or exceed international standards developed by API-610, ANSI, ASME, Hydraulic Institute, and others. 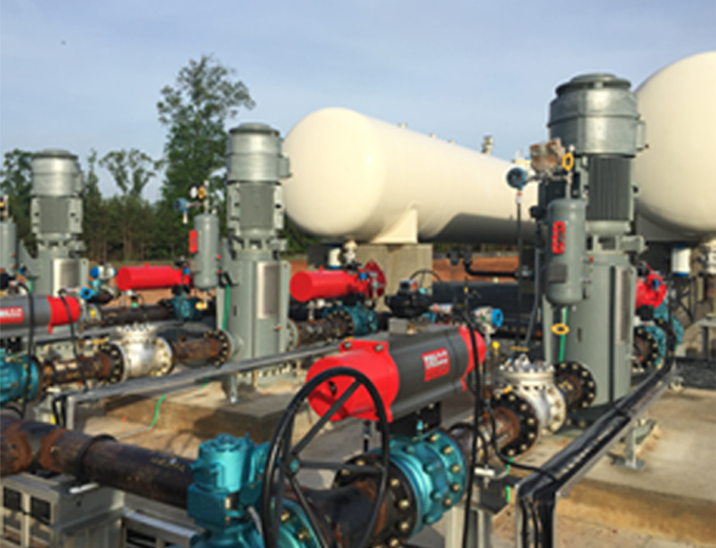 We can deliver unitized systems that include the pump, driver, controls, piping and instrumentation. These pumps are highly effective where there is inadequate system net positive suction head (NPSH) available or there are space constraints which preclude the use of horizontal multi-stage pumps. They are quite often required for high pressure applications in difficult to handle fluids with applications such as hydrocarbon booster and transfer, liquid propane/LNG, chemical transfer, crude oil, condensate processing, brine injection and cryogenic service. Our highly trained engineers can help you configure, install, and maintain systems that require Vertical Multi-stage Barrel Pumps. We also provide replacement parts, maintenance, and repair services to both FisherPump and other brands of installed pumps. Seawater lifts, Firewater jockeys and Utility water supply applications often require a Submersible Turbine Pump. The Fisher Energy team submersible turbine pumps are custom built to our client's specifications. They are designed with the electric motor directly coupled below the turbine pump assembly for simplified assembly. A waterproof electric cable supplies power to the motor from the topside power source. FisherPump submersible turbine pumps are often used offshore in seawater lift, firewater jockey and utility water supply applications. These pumps offer economic solutions for extremely long setting pumps where line shaft length may become an issue. Our highly trained engineers can help you configure, install, and maintain systems that require Submersible Turbine Pumps. We also provide replacement parts, maintenance, and repair services for both FisherPump and other brands of installed pumps.